A new revolt seems to be brewing against Apple's notoriously murky method of approving apps. Known for its questionable rejections and communication-free delays, the App Store has long come under fire by developers who feel they're being left in the dark. Even the guy behind Facebook's official iPhone app called it quits this month, telling tech blog TechCrunch he was "philosophically opposed to the existence of [Apple's] review process." Apple Senior VP Phil Schiller defended the app approval process in a story published by BusinessWeek on Sunday, but neither his explanation nor Apple's recent introduction of status updates for developers seems to have calmed the storm. And now, the opposition is about to get even louder. Enter AppRejections.com, a new Web site designed to track and catalog all the "unusual" and "unfair" rejections from Apple's App Store. Launched just days ago by UK-based iPhone developer Adam Martin, App Rejections takes a strong stance against Apple's methods. "There are now more than 100,000 iPhone applications available on the App Store," Martin says. "However, Apple has a secret, undocumented, unquestionable, random process for deciding which applications to allow onto the deck." Martin cites the rejection of Google's Google Voice application as the impetus for his creation. 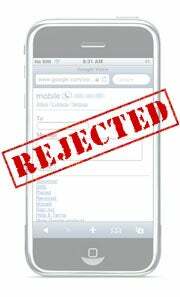 Following that controversy, he believes, the number of questionable app rejections skyrocketed. "Since Apple point-blank refuses to document the criteria, or even to discuss the matter on anything except a case-by-case basis," he says, "I decided to collate all the known examples of rejected apps -- and so this site was born." Martin says he's currently going through backlogs of past Apple rejections and hopes to eventually feature every documented case. Let's just hope he isn't planning on developing a companion app for the site, too. I think we all know how that would end. JR Raphael is the co-creator of fictitious iPhone app iAgra. You can keep up with him at eSarcasm, his geek humor Web site, or via Twitter.